Whatever you can think of, there’s probably an app for it. In Buffalo, that now includes a new way for citizens to help law enforcers solve crimes. The community watchdog organization Crime Stoppers Buffalo on Thursday unveiled “Buffalo Tips,” a mobile app that gives witnesses a way to anonymously submit tips. 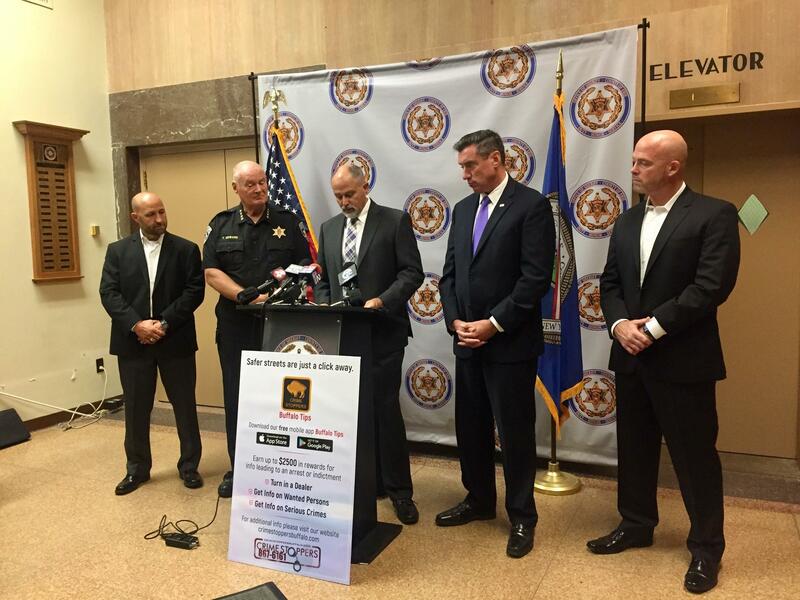 Representatives from various law enforcement agencies unveiled the new Buffalo Tips app. The digital upgrade was inspired partly by the success of the opioid reward program that Crime Stoppers launched in March. To keep up with a two-fold increase in tips, they realized their website and phone number weren’t cutting it anymore and they had to make a change. The free, password-protected app ensures anonymity by assigning a number to each user instead of using their cell phone number or name. The simple interface clearly displays four options: “submit a tip,” “review/update existing tip,” “call hotline” and “wanted suspects. The “submit a tip” form reminds users at the very top to call 911, since it is not an emergency app, and then asks for general information: how you know them, their name, alias, phone number and social media profiles. To follow up on a tip, check the “review/update existing tip” menu. The “wanted suspect” feature shows perusing users a bulletin board of suspects and unsolved crimes. Erie County District Attorney John Flynn says the anonymous nature of the app helps law enforcers address their biggest problem when soliciting help from the public—witnesses not coming forward out of fear. “They’re afraid to get involved, they’re afraid to put their name out there because they’re fearful that the individual or individuals who are responsible for the homicide, are going to take retribution on them. The beauty of this app is that when you go on this application and download the information, your name is never on there,” Flynn said. Aside from convenience for the user, the app takes weight off the shoulders of Crime Stoppers. It makes connections based on little information in the scientific way only a computer can. Crime Stoppers has doled out $14,000 in rewards so far since January, edging last year’s total of $16,000 just a bit more than halfway through the year. Most of their money comes from private donations, but both the Sheriff's Office and District Attorney’s Office made contributions totaling $35,000 to fund the app and rewards from their asset forfeiture funds.